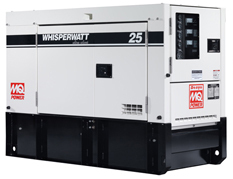 The DCA25USI provides a prime rating of 20 kW (25 kVA) and a standby rating of 22 kW (27.5 kVA). A sound proof housing keeps operating noise levels to 59 dB(A). The unit features a mechanical governor that maintains steady state 60 Hz within 3-5% from no load to full load. A comprehensive analog control panel provides instrumentation including AC ammeter, AC voltmeter, frequency meter, AC circuit breaker, engine gauges and much more.